Have a question about Creatine Powder Micronised? What is it, what does it do, how and when to use or something else? Ask us. 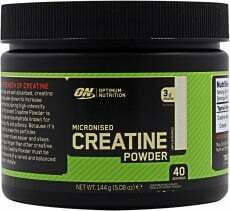 “Creatine Powder 144g” is currently out of stock. Enter your details below and we will let you know when it's back in stock. ALLERGEN INFORMATION: Manufactured in a plant where various seeds and nuts are used. Add 1 rounded teaspoon of Micronized Creatine Powder with a glass filled with 237ml-355ml (8-12 oz) of cold water or fruit juice. Then mix it up with a spoon. TIP: Power-up protein, meal-replacement, and weight-gainer shakes with a rounded teaspoon of Micronized Creatine Powder. WARNINGS Creatine Powder Micronised : Check with a qualified health care professional before using this product if you are under 18 years of age, pregnant, nursing a baby, or if you have any known or suspected medical condition(s) and/or are taking any prescription or OTC medication(s). Keep out of reach of children. Store in a cool, dry place. These statements have not been evaluated by the FDA. This product is not intended to diagnose, treat, cure, or prevent any disease.